What is “double opt-in” and why does it matter? What is “double opt-in”? And why does your email provider want you to use it? When you send traffic to a landing page or squeeze page, you will have a form to collect an email address from your visitor. When someone submits the form it sends their email address to your email list. Maybe you have your list hosted with a paid service like Aweber or MailChimp. 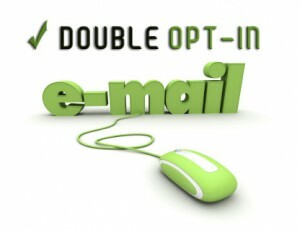 Some email providers prefer, or even require that you build your list using “Double opt-in”. This means that the visitor first gives you their email address through the form on your landing page. Then you follow up with an email that contains a link that they have to click on to confirm that they want to subscribe to your list. So the two steps (your form and the link click) is the double. The goal is to confirm that the person entered a real email address on your form, and that it wasn’t a fake or mistaken email address that they don’t have access to. It also stops bots that fill out your form, but won’t confirm the fake email address. Emails to these addresses would probably bounce, and over time that will hurt your email deliverability with the email service provider. So they prefer that you use double opt-in. However in online industries like MMO, MLM, Network Marketing, etc. double opt-in can severely lower our conversion rates. Our audience is typically resistant to following up on that confirmation email. I’ve had double opt-in drop my opt-in rates from 50% to less than 10%. If you use a service Aweber, and you request that they disable double opt-in, I suggest that you tell them that you will continually clean your list of bad emails and unresponsive subscribers, which is something you should do anyway. You may also consider self-hosting, which means you run your own email auto-responder program. There will be a learning curve and you will be responsible for running the system But you can run it however you choose. Of course you also run the risk of ruining your sender score if you run it incorrectly. Jennifer Ann Jackson's testimonial for my services. Katie Z. Meyer's testimonial for my services. Ace and Rich's Testimonial for the Super Affiliate Network. How Gabriella Fluturas Made 29 Sales In 1 Week with the Super Affiliate Network.